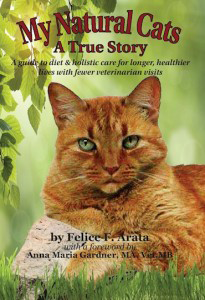 I just found this book on natural flea care and bought it. Every summer I am asked what to do about fleas. While my cats don’t go outside the screen patio area and the screens here are a tight mess keeping out bugs I haven’t experienced any fleas yet. Although over the years I have read that when cats are fed a raw diet they have zero problem with fleas becasue this diet keeps their immune system strong. I know for a fact while I used to walk King Tut on our property in Texas he never had one flea on him; Tut would lay on the grass for long periods of time too. I have pictures of him in our gallery doing this. So maybe there is some truth that a raw diet for cats prevents fleas.